It's Monday and another start of a new week! Here in Colorado we are expecting high temps in the 70's to lows in the 40's, (day temps, I'm talking here)! Yes, sunshine and snow, all coming in this week. Coloradans in Spring time have the privilege of experiencing all four season in a week and often in a 24 hour period. Never dull! I finished a 9 month long project of a 3" scrap block quilt. Those nine patches are 1' squares and this quilt is BIG. My favorite quilts are scrap quilts, all the different fabrics and colors make my heart soar. 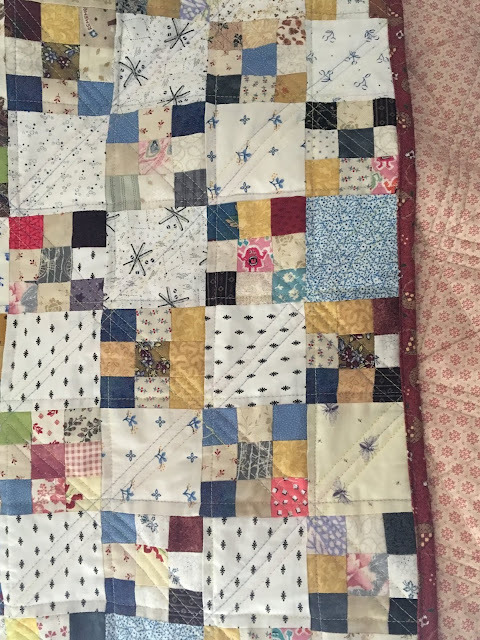 Scrap quilts, also give the opportunity to use up all the "scraps". Fabric has become very expensive and throwing out scraps for me is a SIN. Use it up or do without! This quilt I will be keeping, so many fabric memories sewn in this baby. I best get out in the sunshine before I have to don the parka and boots. Soon the garden work will begin and only light weight knitting can be done on back porch, hot sun and wool yarn-no no no, not for me. I have finished 3 sweaters since Jan.1 thus far this year. Two were started in 2019. I would love to be one of those prolific knitters, but I get side tract all the time with new cast ons and fun yarn. I guess I have difficulty staying focused on just one project. The sweater in this post is Humulus and a fantastic knit. I really made this for my youngest but when I had Caitlin try it on, I realized it would need about 4 more inches to fit Erin properly. So, Caitlin loves it and with her, it will stay. I get to knit Humulus again! I do not mind knitting the same pattern twice or even more if it's a good pattern and Isabel Kraemer's patterns are always good. I joined the National Rug Hooking Association. 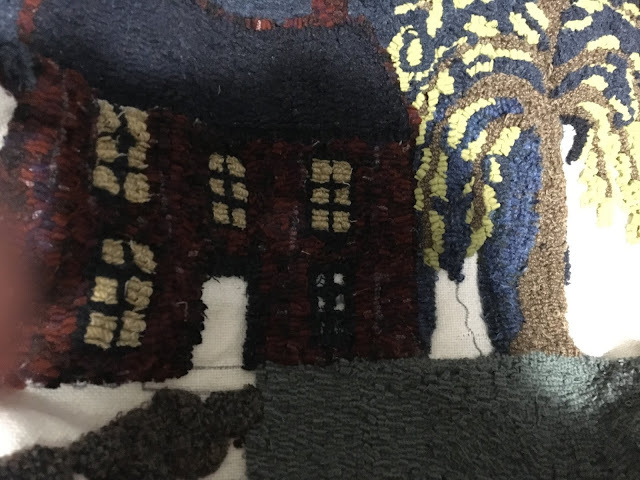 I have always been intriqued with rug making and I'm going to try this art form again- now that I have time. Oh, and I have a pile, (several piles) of wool to use up! this book is a very good, a story of friendship between a white girl and a black woman during the 60's in the deep south-nough said! I have read all of Sandra Dallas books, this one not so good. The story was interesting, but the ending a total flop! A mindless read with a feel good ending. A great reference book with some wonderful ideas. Trying to stay home and cook more for meals. I think I'm a better cook than most meals we get at resturants and I can make meals for much less money. Homemade pizza that Eric and I both enjoyed, with "whatever" salad. It is time for me to start experimenting with salad dressing recipes this spring, I plan to grow all different kinds of lettuce. I'm still having trouble with creepy people looking at my blog site. Wish I could block them! Any ideas? I completed several knit projects for gifts, along with one sweater, one sweater that I need to rip back and add length(ripping done, knitting up fast), there shawls, one pair of socks, and one pair of fingerless mitts! Whew, feels great! Also, everyone received a handmade quilt! 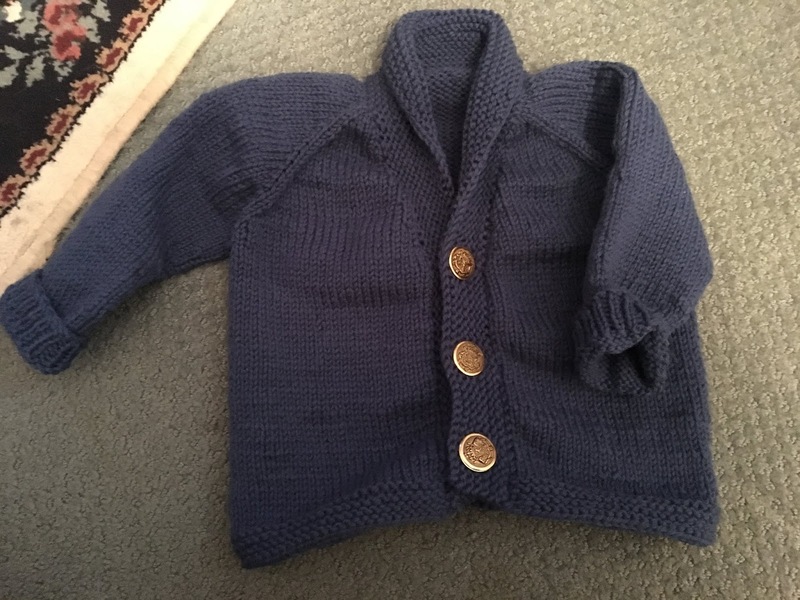 I love that my children love all my knitting and sewing projects. They are really good people! Very good book, hard to put down and a must read! I have been a Laura Ingalls fan since third grade before her books were even popular! The World of Laura Ingalls has some great information regarding the Ingalls family. We all have colds here in Colorado, so I made chicken stock over the weekend and today it is chicken noodle soup. Homemade stock is over the top in taste and nutrition, I doubt I can ever return to store bought again. Trying to get outside daily for a walk with the littles, taking in the Christmas decorations around the neighborhood. Betty brought along her stuffed stretchy snake to show 'it' all the decorations. Two year old's and the conversations they hold with themselves, family, really anyone and no one makes me smile and love this girl to the moon and back. It was very cold this day, below freezing with a slight breeze, little Gus had to stay in buggy all wrapped up for he had no shoes on....Mimi! Betty decided she did like her yellow "Pete The Cat" sweater, she now is wearing it all day long, two days in a row. No figuring why, when or what a child will decide the outfit for the day. Take the sunglasses and binkie, both blue, but it was so cloudy outside that lights had to be turned on inside, she was not going to take off those sunglasses inside or outside....haha. 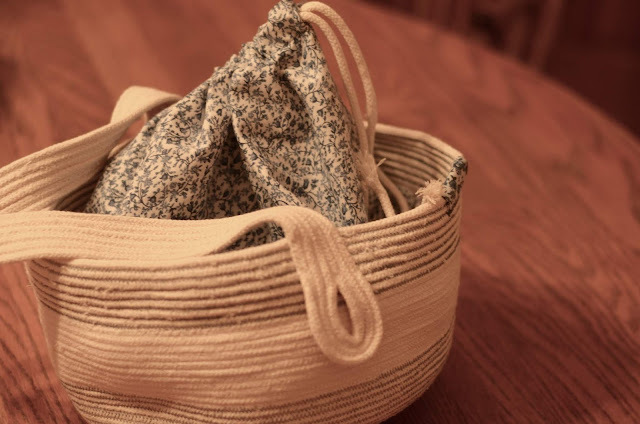 I have been spending a little time sewing rope baskets. This one, I put in a draw string bag for all the 'extras' that get thrown in. Draw the strings and one is less likely to loose all that loose much loved items. I'm kinda smitten with this basket. Time to start thinking about Christmas, I'm going to have a full house! 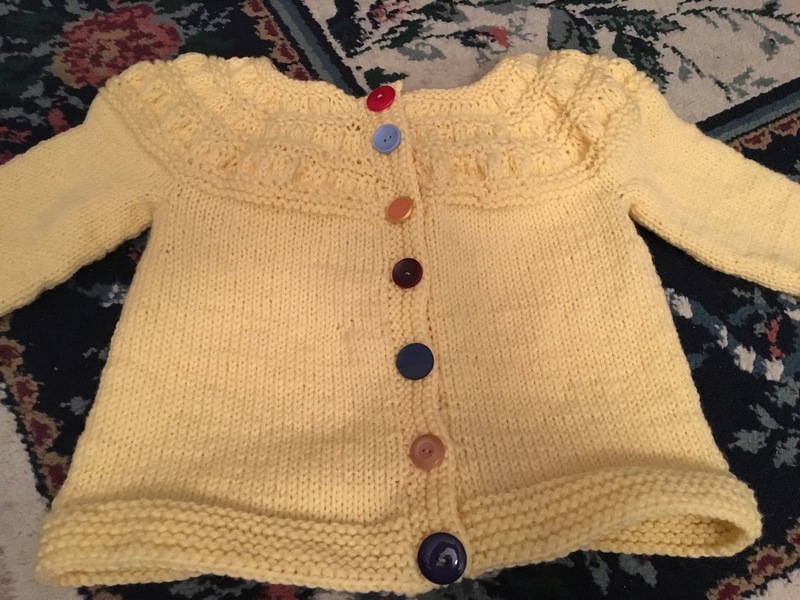 I remember when Ginny decided to bring YARN ALONG back, though only once a month, my thoughts were, 'once a month,' that's not nearly enough YARN ALONG time!' It must be my age because I feel like I'm always behind with YA. I would have my post ready in the 'old days', now I feel good if I post on the YA day...huh! I finished this Tiny Tea Leaves sweater for Betty two weeks ago. She was so excited for her new 'yeawow' Pete The Cat sweater (our name for the sweater), picking out the buttons, which was an entire morning experience. I put the buttons on and she has REFUSED to wear the sweater! No tricks or bribes will she don the sweater on her shoulders. So it sits- on the table where we all lay our eyes on it, daily! Two year olds!!!!!!!!!!!!!!! I have since moved onto a sweater for Gus, Leaves or not. Both sweaters have been worked in Brown Sheep-Nature Spun, worsted weight. Yarns were bought at the Yarn show in Loveland Co. It's been getting colder with each passing week, and, I LOVE IT! It's hibernating time for me, time to knit morning, noon and night, with lots of reading, quilting and sewing going on as well. I wish my neighborhood looked more like this today! Back to books, Voluntary Simplicity- love, love this book, so many things to ponder and to work on, not overwhelming though. 'Jacob's Ladder: A Story of Virginia During the War.' This book I found through the New York Times obit. story on the author, Donald McCaig. He was chosen to write books continuing the 'Gone With The Wind' story. Apparently, the Mitchel family was not very happy with book and sequel to Gone With Wind, "Scarlet" I read Scarlet and I did not enjoy it, the story had no depth what so ever. Can you believe it, next time we all meet up it will be 2019!! Love seeing what everyone is doing! This gentleman was out looking for a Thanksgiving meal, nothing open. Stopped at shop(thinking MOM was open to public), one more, no problem! Line on Friday to the liquor store? I have no idea what was on sale in there, must of been good! Good morning! I wanted to document our first Thanksgiving celebration at Me Oh My Pies and Coffee. Caitlin and Jason both are from LARGE families and Holidays can be a bit of a juggling act for them, add two children age 2yrs and 1yr, well lets just say it can become more a hassle than fun. This year they decided Thanksgiving would be celebrated with one dinner for everyone at the shop. Everyone pitched in and brought dishes, this of course is a sure bet for some amazing food and family traditions to share! The dinner and family time was a major success! I’m sure this will now become a new tradition for both families. I have been meditating for several weeks now- fifteen minutes a day. Who knew how life changing this habit would become. I carry so, no all my tension in my shoulders, neck and arms. I have always had stressful jobs and that stress kinda took up residence in my body, even after retiring I was still wearing my shoulders as ear rings( yes I have been on BP drugs for years now). Meditating and breathing has helped with the mind boggling conversations in my head,(they are less), made me aware of the tension in arms, neck and shoulders so I can consciously relax those muscles. I am noticing that I breathe more before answering tough questions(annoying questions), that I look at people for who they are with so much less judgment and over all accept I am not in control and let the world roll without my constant manipulation. I am in awe of this practice and will most likely look at some meditation groups after the holidays. I’m hoping that all had the Thanksgiving they needed, time spent with loved ones and the experience of gratitude.